Keeping positive about finding it is a must. Think about it like this: you do not have to find a lost gecko, simply find its hiding place. They can go a good while without food and water. Most are found quickly but I’ve heard of one appearing eight months later. While you are in the hunt for your gecko you can also be assessing how the escape took place. Did you leave the key to its condo in the door lock? Supply a natural ladder that you spent hours of time on for them to climb? Or didn’t know you had a “carpenter morph” and left tools and a couple of two by fours in the tank…….… Seriously, figure out how the gecko may have gotten out so it doesn’t happen again when you finally find it. in a warm house with a carpeted floor the gecko may move about seeking other warm spots. In a house with cooler conditions, perhaps with vinyl floor covering or a concrete slab floor, it may be satisfied to hide in more of a brumation safe-spot tightly tucked away. 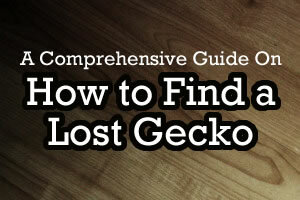 Here are some quick and easy places to look for a missing gecko. See if it’s still in its tank. If the tank has carpet, look underneath the carpet. Make sure it’s not in another gecko’s tank. Lift up loose rugs or throw-rugs and look under them. 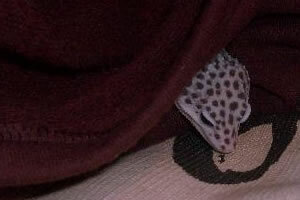 Check your bed coverings……geckos can jump up and climb the spreads, blankets, etc. Your gecko might even be under your pillow! You’ve gotta take it apart piece by piece; you can’t just glance at it. Look under ALL furniture and use a flashlight. Remember that it can be on the move so one check is not good enough until it is found. Any shoes on the floors or in closets? Shake them out because many have been found in the toe of shoes or house slippers. Moisture in a nearby bath or shower area may attract your gecko. Check the shower curtain as one of mine was found in the folds of the curtain. Check heat coming from a fridge floor area. Many have been found under the fridge. You may have to roll it out to check underneath. SO BE CAREFUL ! Don’t run it over or you have wasted your time finding it. Other warm places to check are the gas water heater area and the laundry room, especially the dryer area. The first place to look is the room it’s housed in. If you have searched the room, and still have not spotted it, you now need to expand the search. With flashlight in hand look under every piece of furniture in the home. In the case of arboreal geckos, look upwards on the walls and windows. When you search a cluttered floor area really well, such as your closet, and you shake out the toe end of shoes, etc., be sure to set all those things up someplace else so you know the gecko hasn’t re-entered after your search. Once you’re sure your gecko is not in a particular area, you can set up an attractive spot for them there and try to attract them to it. For example, when a floor area, say a closet, has been searched well get an empty shoe box or something similar to make into a humid hide. 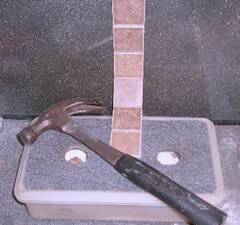 Cut a hole in each end and one in the front, place moist paper towels in it and set it against a wall so it has a chance to be entered from 3 directions. Check it often!!! If the floor is empty it makes it easier to find the gecko, but if not do it anyway. Sure, meal worms can be added, if you want. 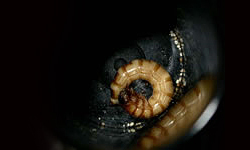 Put a slice of carrot in with the worms so they will remain healthy. REMEMBER: check often. 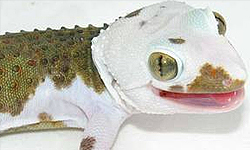 Your gecko can go a pretty good while without food or water. Its first priority will be to search for a protective spot, hot or cool (so it can be changing spots to find the temperature needed). Once it gets an opportunity or begins to feel safer with the surroundings it will search for water and food. Remember, your gecko escaped while under your care. You are responsible for its safety. You are responsible to find it. So you should look everywhere if you have an escapee, even in the least likely of places, because it just might be there. Look and look again, and then again, until it’s found. And you will probably find it. 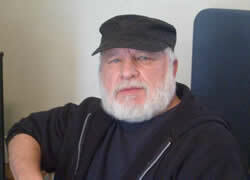 H.J.Rudy, retired computer programmer and real estate broker has been involved with animals for the last 15 years. Prior to being a gecko hobbyist breeder for the last six years, he was owner of pet businesses: Schnauzer Lovers, and the Tropical Fish Center. Other past-time hobbies include carving and setting crystal in wood, along with abstract paintings on canvas. .
There’s nothing more you can really do except to keep the interventions going and hope for the best. I’m planning to write and publish an article here soon about some incredible lost gecko finds I have experienced. You can also check out the article on this site titled “Found” which describes my finding a leopard gecko that escaped as a hatchling after 2 years. The tactic I used to find my crested gecko was to leave the lights low and wait until late at night, around 1 AM when I knew he was usually active. Then I walked around quietly, listening, and looking. Within minutes I found him on the kitchen floor near the fridge. I presume he was camped out under there for the day because he darted under as soon as I tried to grab him. I had to pull it out and chase him out from behind the compressor. He’s safely back in his now-secure home. Since your tokay gecko is arboreal, look up. There is a chance that you’ll find it eventually towards the ceiling. I once lost a much smaller electric blue day gecko and found it after about a week just handing out on the wall. There is always the chance that it’s gotten out, or wedged itself in some place that it can’t get out of. You could try hanging some kind of fake plant high up on the wall and maybe it will decide to hide in it. Mine came back 9 months later ……. I lost my leopard gecko and i’ve been having some trouble finding him. He has been lost for two days now and I need some tips. I hope you’ve been able to read the article, which I think gives extensive tips. The only other thing I can tell you is that I’ve had a gecko missing for as long as 2 years, so don’t give up! Hey my golden Gecko got out, and I have an idea of where he is but I can’t get him out. I left meal worms out and a dish of water. I have a cat and she found him once but I smacked her out of the way but he took off and he is in the most impossible place to reach. I keep going back to check on him but he won’t come out. Okay, I just lost my gecko and I searched for her. In fact, she’s a 3 month old baby so I’m naturally panicking on the insides but this article helps me relax and laugh a little. My daughter got a gecko for Christmas this year. It jumped off of her and ran under a piece of furniture. When we moved the furniture, we saw the gecko crawling into the corner where two walls met – he (leopard gecko) escaped into that corner in a small gap between the carpet and the floor board. Behind the walls it is cold, so I’ve got to believe he is looking for warmth. I have put his aquarium on it’s side, his aquarium warmer is on its side and just outside the corner he went into, put his rock condo down in the same area, caged in the area as best as I could, and I’ve got an app going on an ipad playing cricket noises next to his cricket holder. I loaded a night-vision app on my daughter’s phone and she is watching the hole and sobbing. Very sad. I don’t believe there is anything else we can do, but I would love any input. I’m sorry you’re going through this. I think you’ve gone way above the call of duty! Remember that he’s more likely to come out at night, and you can let her know that if it will make her feel better. It may take awhile –I’ve had geckos missing anywhere from 1 day to 2 years! Later at night, try turning off the lights and looking through the entire room with a flashlight. Good luck! Hopefully you read the article about finding an escaped gecko. If not, please do. Close the door to your room and keep the cats out. 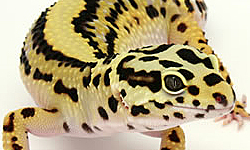 Use the information in the article to look for your gecko. I have 2 cats and have had numerous geckos escape and get found. Often they turn up under the fridge because it’s warm. Pay attention to any place that your cats are paying a lot of attention to. The last 2 times I located a missing leopard gecko were because the cats were looking really hard in a particular place and there she was! My mom left my tank lid opened to give him water and never closed all the way. i dont know if he went out of my room since i didnt know until today evening. i think he escaped yesterday not sure when. i laid out containers around my room but not sure if he is in there at all?? any help tips or anything? could he climb on my high up bed? can he climb on my furniture? could he be wondering around my others room, just to say we have a huge house and steps could he go down there? You don’t say what kind of gecko it is. If it’s a leopard gecko, it’s highly unlikely that he would climb up anything. I just found two of my geckos that escaped, one after a day and the other after a week. Keep looking, especially in the evening. Keep the containers out. Look all around the house just in case. Be patient! yes its a leopard gecko, but good news i found him yesterday night. i was laying on my bed and he got up on my bed and found me. so he is fine and back in his tank. That’s great! I’ve generally had good luck with a variety of escaped geckos. I’m glad you found him.